This is a complex question. The GCA-03 Series can detect alpha, beta, x-ray and gamma radiation. Checking fish or food for radioactive contamination is a little difficult and Geiger counters, (from us or any other manufacturer) is not the ideal instrument to do so, here's why. 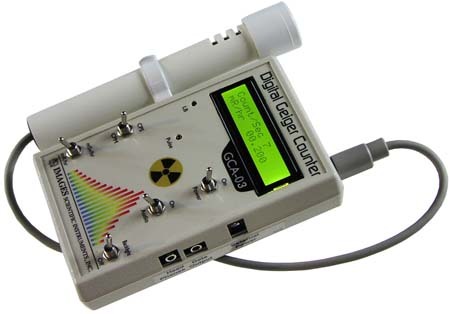 The GCA-03 Series Geiger counter can detect alpha radiation. However if the fish (or food) being tested has a alpha radiation emitter internally, the food itself will block the alpha radiation and stop it from being detected. If the alpha radiation contamination is on the surface of the fish (unlikely), it can be detected. The GCA-03 Series is sensitive to x-ray radiation, so you can detect and log x-ray radiation. There is free Geiger graphing software available on the Images Co website. Keep in mind the GCA-03 Series is calibrated using a CS-137, so the best accuracy is obtained when detecting and measuring radiation from that radiation source. The CT scanner uses x-rays which are detectable by the GCA-03 Series. If the scanner is leaking x-radiation you ought to be able to detect the leakage using the GCA-03 Series. The GCA-03 Series is assembled and built in the United States. Yes, you must have it NRC certified after you have purchased the GCA-03 Series. NRC certification cost $125.00 plus shipping and takes approximately two-three weeks to ship to laboratory and have it returned certified. NRC certification is good for one year. The GCA-03 Series does not have a built in alarm. However the full version of the PC software for the GCA-03 Series does. This alarm may be used when using the PC software to monitor radiation levels. The alarm may be set using either CPS value or a mR/hr value. Does the gca-03 use a "pancake" style geiger-mueller tube or a standard style tube? Does the GCA-03 Series have a scintillation detector option? No there is no scintillator detector option for the GCA-03 Series. The second question I think you are asking is how to separate out background radiation from a radiation reading. What I would do is take an hour's worth (60) of one minute readings. This is the CPM (counts per minute) mode on the GCA-03 Series. With this data collected. I would add the 60 readings together. I would then take that total and divide it by 60 to get an average CPM reading. Next I would look through the 60 CPM readings and mark down the highest count CPM reading, and the lowest count CPM reading. Those two CPM numbers are your Max and Min. With this information you take a radiation reading off an object. You can first determine if the radiation reading(s) are greater than you MAX CPM number. If the readings are consistently greater, you can make a logical assumption that there is an increase in radiation due to the object you are testing. This Geiger counter may be used in those applications. The advantages of our GCA-03 Series is that it may be NRC certified to its accuracy. While many Geiger counter manufacturers claim high accuracy for their Geiger counter, it simply is not true. Fortunately the United States Government has a license standard for Geiger Counter accuracy. This is a Nuclear Regulatory Commission (NRC) certification for accuracy. NRC certification can only be performed by a nuclear laboratory licensed by the United States Government to perform such certifications. Without this certification, you can not be sure of any claim that a Geiger Counter accuracy is valid. The Geiger Counter itself has a one-year warranty for manufacturing defects. The GM tube in the wand however is not covered by the warranty. The mica window on the front of the GM tube that allows the Geiger Counter to detect alpha radiation is very delicate and if mishandled will break. Yes. Deplete Uranium (DU) is slightly radioactive and according to the spec sheets I've read emit mostly alpha particles. The GCA-03 Series can detect radioactivity over background radiation. Although DU is not available to either test or make measurements. The independent laboratory we use for testing and calibrating our Geiger Counter can only test up to 1000 mr/hr or 1 RAD or radiation. That is the limit this lab can test and at this radiation level the GCA-03 Series does not saturate. I do not know how much greater a radiation level the GCA-03 Series can detect before going into saturation.